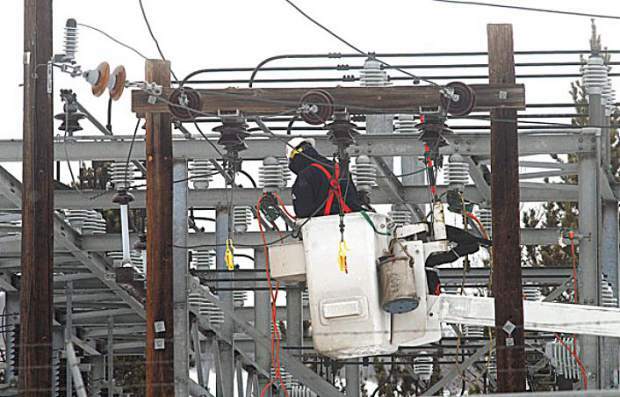 An Xcel employee works at the Frisco substation following a power outage in 2016. Summit County residents woke up to rolling power outages throughout the area on Friday morning after Xcel Energy experienced low pressure in their natural gas lines, effecting about 17,600 customers in the area. Mark Stutz, a representative with Xcel Energy, said that the company was alerted to low natural gas pressure in the Summit County area at around 4 a.m. on Friday. At 5:30, Xcel started efforts to stabilize and balance the system using controlled outages, rotating power to different areas around the county every 30 minutes. The controlled outages were a strategic move on the part of Xcel. Michelle Aguayo, a spokeswoman with the company, said that natural gas pipes require a specific amount of pressure inside the pipes (measured in pounds per square inch) in order to maximize usage. “When it drops below the normal pressure you won’t get optimal use, and it can put a drain on the system,” said Aguayo. Aguayo said that customers still had natural gas services going to their homes and businesses, but the controlled outages were preventative measures to stop a complete loss of power in the county. The outages effectively prevented the use of gas-fueled furnaces, as Xcel didn’t want furnaces pulling gas from the already low-pressure system. Additionally, the outages prevented pilot lights from extinguishing, which would have required Xcel to go door to door throughout the county to relight them. As Xcel worked to identify the cause of low natural gas pressure, the effects of the power outages were felt around the county. Sheriff Jaime FitzSimons said that traffic became an immediate concern, with traffic signals flipping on and off throughout the day as Xcel shifted power from one area to another. “The main impact of the rolling brown outs was traffic signals going on and off,” said FitzSimons. “People weren’t paying attention to the lights, and they caused accidents all over the county.” FitzSimons continued to say that the sheriff’s office was forced to request additional resources from the Colorado State Patrol in order to deal with traffic issues. FitzSimons also noted that the Summit County Justice Center was running off of a generator during the power outages, and the jail was placed on lockdown for safety reasons. Red Cross was on standby to set up warming shelters in the county in case the outages continued through the night, though they didn’t end up being necessary. The fire districts also had a busy morning. Steve Lipsher, public information officer with Summit Fire & EMS, said they responded to at least six calls to extricate trapped people from malfunctioning elevators around the county. Jim Keating, chief at the Red, White & Blue Fire Protection District said they responded to about a dozen calls for elevator extrications. Keating went on to say that the department ran into some trouble with maintenance teams inside the buildings trying to remove trapped passengers themselves. As emergency workers hustled to keep up with the domino effect caused by the power outages, schools and ski resorts were also pivoting to address the issue. Summit School District decided to close its elementary schools as a result of the outages, and the county’s ski resorts were all forced to delay openings until power was sufficiently restored. Arapahoe Basin Ski Area was completely without power from about 7-9 a.m. A-Basin then opened its Black Mountain Express, Lenawee and Pallavicini lifts to the public at 9 a.m., as planned. Before the ski area’s power returned, though, A-Basin operated the lifts on generator power. At 10:45 a.m., A-Basin opened its Montezuma and Beavers lifts. Over at Vail Resorts’ two Summit County properties, Breckenridge Ski Resort and Keystone Resort, Vail Resorts spokesman Russ Carlton said both resorts experienced delayed openings and were able to open for skiing and snowboarding with limited services using backup power sources. Breckenridge opened just after 11 a.m., with a handful of lifts open on four of its five peaks. At Keystone, the resort opened its River Run Gondola, Peru Express and Montezuma Express chairlifts shortly after 9 a.m., before opening select lift-service access to The Outback and North Peak at noon. And at Copper Mountain Resort, several of the resort’s most remote, above tree line lifts remained closed into the late morning. Because the power outages were controlled, St. Anthony Summit Medical Center was not affected due to its status as a critical operations center, said Brent Boyer, communications advisor for the hospital. Additionally, the hospital’s emergency and urgent care clinics at the base of Breckenridge, Keystone and Copper remained open for walk-in health care services throughout the day. By about 12:30 p.m., Xcel Energy rerouted the flow of its natural gas lines, a temporary fix that restored power to 13,800 customers. Xcel was able to restore power to the entire county by about 2:30 p.m. Despite an ongoing investigation throughout the day, Xcel still wasn’t sure what caused the initial drop in pressure in the natural gas lines, or where exactly the problem originated. Aguayo said that Xcel would have staff in the mountains throughout the weekend continuing to try and identify the cause, and come up with a permanent solution. Aguayo also said they don’t believe any customers completely lost natural gas service to their homes or businesses during the power outages, but noted that anyone who returned home to discover their pilot light was extinguished or gas stoves weren’t working should immediately contact Xcel. The company is establishing a plan for relights. If you smell gas or a “rotten egg” odor, immediately evacuate your home and contact Xcell energy at 1-800-895-2999. This is the second widespread power outage in the county in the last six months. In September, Breckenridge suffered sporadic power outages throughout the town after a piece of equipment inside a transformer malfunctioned.